What are my health rights? In Australia, everyone has health rights. This means you can expect to receive an equal level of care to everyone else in the country. Everyone a right to expect quality and safe health care at every visit. You have a right to have an interpreter available, by phone or in person, during any health encounter (in the hospital or at the doctor). Quality and safe health care health care requires a partnership between patients and their health care providers to ensure everyone is happy with the support being offered. It is your responsibility to inform your health care provider of any concerns you have. All hospitals and health clinics in Australia have a “zero-tolerance” policy towards violence, abuse and disrespect towards staff, patients and visitors. This means that if you are, violent, aggressive or speak rudely, you may be asked to leave or security/the police may be called to remove you from the building. The Beginning a Life in Australia booklet, produced by the Department of Social Services (DSS). Available here. 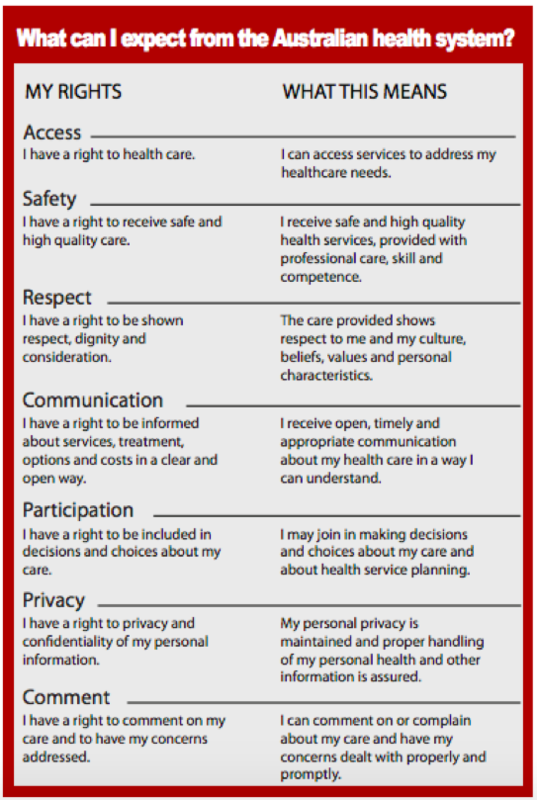 The Australian Charter of Healthcare Rights, produced by the Australian Commission on Safety and Quality in Healthcare. Available here.